Before I begin this review I should probably let you know that I didn’t finish this book. You will understand why in a moment. When she recommends a book I do my best to read it. I was really getting into this book. It started out really strong. Georgia is a woman who found herself pregnant, her boyfriend leaving her to raise the child by herself, and her only option appearing to be that she would have to return home to her parents’ house. Along came a woman who gave her a little nudge into another direction and before she knew it she was running her own knitting supply store. There is obviously a lot more that goes into the story, but I don’t want to ruin it if you decide to read it. 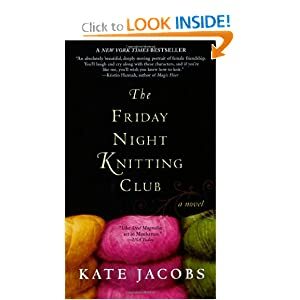 The fact that the author shows that knitting doesn’t have to be something that just old ladies do really appealed to me. Many people my age feel that my cross stitching is something that only old people do. Ha! I’ll be lucky if I can see the little holes in my evenweave when I’m old! Sometimes just because something is low-tech or ‘old fashioned’ doesn’t mean that we should let it die. I don’t know how to knit or crochet, but I would like to learn. I fear that some of these needle arts are becoming a dying craft and we can’t let that happen. Anyway, back to the book. The women in this book are strong characters and that really appeals to me. They weren’t mousey little women like that pathetic Jane Eyre. There were a couple of things that happened that I didn’t agree with the author in how she resolved them, but they were minor things. Until yesterday. Picture this… I am sitting with Jay in his basement. He is working on one of his planes and I am kicked back on my chair, feet propped up on the washer, nose-deep into my book. Suddenly in a fit of disgust I close the book and throw it on the washer. “That’s it! I can’t read that book anymore!” I don’t think that Jay has ever seen anybody react in such a way to a book. I refuse to finish it. Remember that I read mainly nonfiction. In order to enjoy a piece of fiction, especially if it’s not supposed to be Sci-Fi or Fantasy, it has to be plausible for me. This book went from being a good read about strong women, to an impossible romance. I mean, the father of the baby comes back into the picture and suddenly wants to be involved in everything. That’s not the part that got to me. After not seeing this woman for 13 years he realizes that he still loves her and wants to be with her. When she goes over to Scotland to visit her grandmother he follows her and ends up showing up at her grandmother’s. They were taking a walk and he was telling her how he really felt when I slammed the book shut. I don’t know if the woman falls for it or not. I don’t care, either. As soon as the author had him showing up in Scotland, even though he lives in New York City, that was it for me. I turned to Jay and explained. I told him that I didn’t think that it was realistic for any guy to go chasing a woman overseas, especially when he knows that if he just waits she will be back. I mean, she owns a store in NYC. It’s not like she’s never coming back! So why waste the time of chasing her down just to proclaim your feelings for her? What a bunch of BS. Besides, if I was away on a trip to clear my mind and visit my grandmother whom I hadn’t seen in many years I would be PISSED to have him be arrogant enough to show up out of the blue. To me that’s not romantic. Am I too much of a realist? Am I too practical? I don’t know. Either way I will be handing the book back to my sister today and thanking her for letting me borrow it, despite the fact that I refuse to finish it.